A group photo from ITSC-19, hosted by the Korea Meteorological Administration. Credit: SSEC. 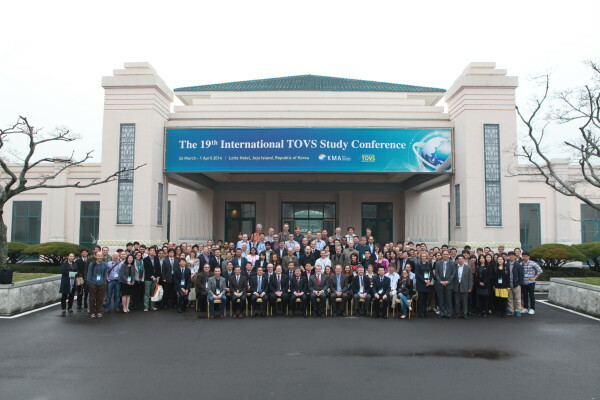 The Space Science and Engineering Center (SSEC) at the University of Wisconsin-Madison will be hosting the 20th International TOVS Study Conference (ITSC-20) from Oct. 28 to Nov. 3, 2015, in Lake Geneva, Wisconsin, USA. The official meeting of the International TOVS Working Group (ITWG), the conference has been held every 18-24 months since its inception in 1983, and hosted by nations all over the globe. Bill Smith Sr. — the inaugural director for the Cooperative Institute for Meteorological Satellite Studies (CIMSS) at SSEC and a former ITSC co-chair — helped to organize the very first meeting in Igls, Austria, in response to a newly launched atmospheric sounding system: the TIROS Operational Vertical Sounder (TOVS). Throughout the 1960s, the National Aeronautics and Space Administration (NASA) had launched its first series of Earth-observing, polar-orbiting satellites: the Television Infrared Observation Satellite (TIROS) mission. The TIROS satellites were experimental, meant to prove whether scientists could effectively study the Earth’s weather from space. TIROS’ success led NASA to partner with the National Oceanic and Atmospheric Administration (NOAA) in 1978 to launch TIROS-N, a series of satellites with improved observational capabilities that would support emerging global collaborations. The early TIROS-N satellites carried the Advanced Very High Resolution Radiometer (AVHRR), providing day-and-night observations of clouds, oceans, and ice and snow, as well as TOVS, which provided temperature and water vapor information from the Earth’s surface to the uppermost layer of the atmosphere. Due to its vantage point over the poles, TOVS was able to provide atmospheric data from remote areas, such as oceans and ice sheets, where reliable data collection had previously been unavailable to scientists. In response to these new capabilities, several existing working groups and subcommittees from around the world united to share their experience and knowledge of receiving and utilizing spaceborne sounding data — laying the groundwork for ITWG. Originally a NOAA scientist, Smith’s experience coupled with his position at CIMSS provided a dual perspective of the instruments and their data. The development of sounding algorithms grew from the open dissemination of the export package and TOVS data, recalls SSEC scientist Paul Menzel, who was an ITSC co-chair in the 1990s. The international experience shared at these meetings fostered improved approaches to utilizing soundings, and local knowledge combined with remote sensing data enabled improved regional utilization. “ITSC soon became the forum for training, user engagement in product development, and user demonstration of the best utilization of the products – which varied regionally,” Menzel says. In time, attendees began to develop their own expertise and, in turn, could lead newcomers. The focus of the meetings expanded to include applications of satellite data, such as improving weather forecasting models, algorithms, and products. Interest in using satellite soundings continued to grow, and more and more countries got involved — including international weather prediction centers and the World Meteorological Organization. “We started with less than 20 people, and now the meetings are attended by many hundreds,” says Smith. Not only have the numbers increased, but representatives from national agencies on nearly every continent — including North America, South America, Europe, and Asia — regularly attend ITSC to inform their decision-making on future projects and the next generation of satellites. Collaboration has been the common thread from one meeting to the next, says former SSEC scientist and ITSC co-chair Tom Achtor, who was Smith’s associate director at CIMSS. The last time ITSC was held in Wisconsin was ITSC-3 in 1986, which took place on the UW-Madison campus. Not only has SSEC been involved with the meeting throughout its 32-year history, but it plays an important role in its continued success. SSEC director Hank Revercomb and distinguished scientist Allen Huang, as well as Maria Vasys and Leanne Avila from CIMSS, have been working collaboratively to organize this year’s event. Huang, ITWG’s financial director and a former ITSC co-chair, says he feels the meeting is unlike any other conference. The primary aim of ITWG is advancing the optimal and broad use of satellite data, especially for weather forecasting, says Huang, and the meetings are necessary to facilitate that process. Smith, who will be giving a talk on advanced sounders at the meeting, is looking forward to hearing discourse on several hot topics: namely, the use of current hyperspectral sounding data, optimizing numerical weather prediction centers’ use of satellite data, and developing advanced sounders on geostationary satellites for use in severe weather prediction. For this symbolic milestone, the 20th ITSC meeting, SSEC has invited all past co-chairs to a special historical session. SSEC’s tradition of leadership at ITSC shows its commitment to the satellite meteorology community, says Huang. Likewise, he says, the meeting is indicative of SSEC’s positive environment. The full program for ITSC-20 is available online. Follow #ITSC20 on social media for live updates.